Is your browser not as fast as it used to be? It may not be your internet speed! Overtime, our browsers tend to fill up with junk. Some of it we may not even know is there. The good news is, Toolbar Cleaner is here to help you out. This program can clean third-party junk out of your browser that you no longer need and make it run faster in the process. The main function of this program, as the name suggests, is to remove unwanted toolbars from your browser. The best part is Toolbar Cleaner is pretty successful in removing toolbars that don’t seem to want to uninstall properly. Toolbar Cleaner is also able to remove BHOs (Browser Helper Objects) from your browser. When I first downloaded Toolbar Cleaner, I wasn’t expecting much. I assumed it would help me remove some toolbars I no longer wanted from by browser. What I got was a program that actually did so much more. I guess the real reason I am impressed with Toolbar Cleaner is the fact that it ended up helping me out more than what I expected. It is always nice to be presently surprised by a program. 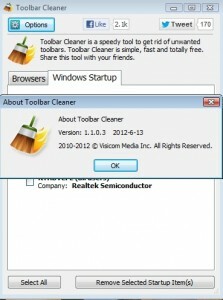 Toolbar Cleaner will help you get rid of toolbars you have installed on your browser. It does this better than I could have predicted at first glance. Don’t get me wrong, it doesn’t do anything magical that you often cannot do on your own — but it was able to remove some toolbars that other programs have failed to uninstall. There was one toolbar on Firefox that had been there for as long as I can remember. I don’t even know for sure how it got there. What I do know is that every program I have used to try and uninstall it has failed. Toolbar Cleaner was able to successfully remove it. That was the first thing that it did that impressed me. Second, it showed me some toolbars I did not even know I had. I assume they were not hurting me too much since they had been there all this time without my knowledge, but it’s kind of the principle of the matter. I had assumed I knew all of the things installed on my browser, because I had used similar toolbar-uninstalling products before. Not only did Toolbar Cleaner find stuff I didn’t even know I had, but it removed them without fail. The last feature that impressed me was the fact that Toolbar Cleaner can remove more than just toolbars. It is also able to find and delete add-ons/plugins/extensions and BHOs. These “helper” files can really build up on your browser if you’re not careful. There are other ways to remove them (just like anything you want deleted), but Toolbar Cleaner does make it simple and fast. 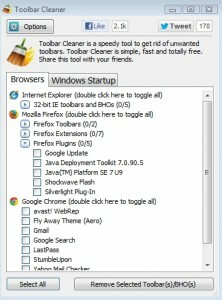 Using Toolbar Cleaner couldn’t be easier. When you run it, it automatically scans Internet Explorer, Chrome, and Firefox for toolbars, add-ons/plugins/extensions, and BHOs and then lists what it finds. You then have the ability to select specific ones to remove — you can even remove multiple ones at the same time. Once you remove something, you are prompted to open Add/Remove Programs to properly uninstall the object in question. The later point I make in the previous paragraph is important to note. In some cases, Toolbar Cleaner doesn’t uninstall anything pre se — it just removes the object in question from your browser and then asks you to go to Control Panel to properly uninstall it. It should be noted that you are prompted to go to Control Panel after removing anything from Toolbar Cleaner but it isn’t always necessary to do so. For example, during my tests I removed some Chrome extensions; Toolbar Cleaner indeed properly uninstalled the extensions, i.e. it deleted the extension files and not just removed the extensions from Chrome. 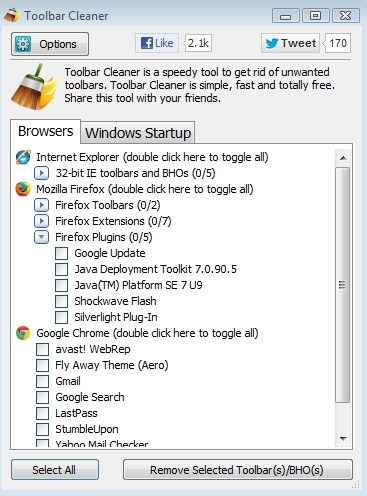 On the flip side, many resistant toolbars and BHOs of Internet Explorer are often just removed from Internet Explorer by Toolbar Cleaner and if you want to properly uninstall/delete them, you need to do it via Add/Remove Programs after you run Toolbar Cleaner. That said, there is one thing that kind of upsets me about Toolbar Cleaner. I can’t stand when a program tries to “force” something on me during installation. If I want to change my homepage or download some kind of site adviser, I would do it myself. I don’t need other programs telling me what to download, and that goes double for your Toolbar Cleaner! I mean, your supposed to help me win back my browser, not add more junk onto it. Alright, so these two things can easily be avoided by simply unchecking their respective boxes during setup (the boxes appear at the end screen of installation — the screen where you hit the “Finish” button). However, I hate when programs recommend other things during installation… especially when they are opt-out instead of opt-in. Easily avoided, but still a con in my book. 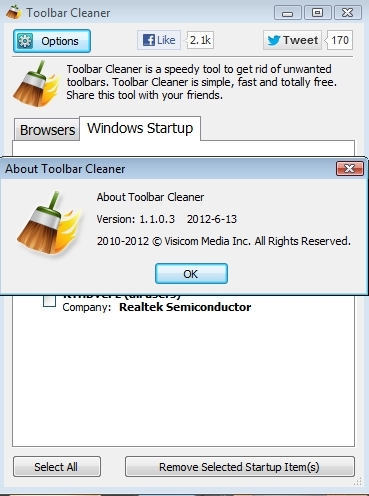 Besides the two things it tries to force on you during installation, I found Toolbar Cleaner to be a big help. I know it is not going to help everyone as much as it helped me, but for such a small program, it may be worth a download just to see if it can work a little “magic” for you, too.